Kolkata July 12 (IANS) When France walk out of the tunnel one last time this FIFA World Cup to take on Croatia in Sundays final pockets of the football crazy city of Kolkata will share the common prayer with the French footballers in Moscow vying to lift the coveted trophy for the second time. At Alliance franÃ§aise du Bengale affiliated to the international network of the Alliances franÃ§aises in the world around 50 expatriates and students will come together in front of a giant screen at 8.30 p.m. local time to cheer for their team. "For the final we will screen the match at Alliance franÃ§aise du Bengale but only for our students members and expats. There will also be some of the expats of other countries involved in the World Cup " Fabrice PlanÃ§on director of Alliance franÃ§aise du Bengale told IANS. 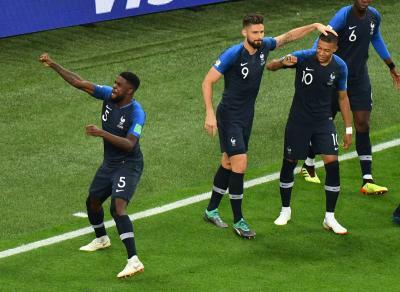 France played like a team possessed against star-studded Belgium in the semi-final on Tuesday with centre back Samuel Umtiti netting a second-half winner. The Les Blues take on Croatia in the summit clash. The Croats came back a goal down to put it across England 2-1 in the second semi-final on Wednesday. Around 25-30 expats and French supporters in the city gathered at a plush city pub Someplace Else in south Kolkata to watch Tuesday s riveting game. "We were in the pub with French expats from the consulate some French volunteers and some Indian French fans here " PlanÃ§on said. "Thanks to our goalkeeper Hugo Lloris we won the game I think. It was some kind of magic actions from him. After the game since it was late and we all had work the next day we went home happy." A day before the final comes the French national day. PlanÃ§on said it will be more special because of the football team playing in the title round. "On the French national day an annual reception will be given by the consulate at Novotel. We will celebrate the national day on the eve of the final so it will be very exciting this year. The next day let s see what will happen " he said. Meanwhile in Chandannagar located 35 kilometres north of Kolkata which was once a French colony then known as Chandernagore the civic body has decided to beam the live telecast of the final on a giant screen on the bank of the Hooghly river. "We have planned it near Rabindra Bhavan on The Strand " an official of Chandannagar Municipal Corporation said. Some programmes will also be organised to highlight a slice of France in the city. "The city is historically so close to France. I feel everybody should get behind the French on Sunday " quipped PlanÃ§on. An hour s drive from Kolkata Chandannagar in Hooghly district was one of the first outposts of India s colonial past a French colony rather like Puducherry. It remained an overseas territory of France in India for different time periods stretching over 250 years since 1673. It finally became a part of the Indian union in 1952 five years after the country won independence from British rule. The town of Chandannagar still has strong French cultural links which draw tourists from the European nation. The Chandannagar Museum and Institute (Institut de Chandernagore) possesses a rich collection of French antiques while the Chandannagar gate constructed in 1937 on the anniversary of the Fall of Bastille has etched on it the slogan of the French Revolution "LibertÃ© Ã©galitÃ© fraternitÃ© (Liberty equality and fraternity)". A French cemetery stands opposite a large lake. Another major attraction is the Sacred Heart Church that was designed by French Architect Jacques Duchatz and inaugurated in 1884. On the day of the semi-final the excitement of France s qualification was palpable across Chandannagar -- from Taldanga to Urdu Bazar from The Strand to the Hospital More. "Like it is for maybe a Messi or Neymar across Kolkata here our heroes are (Antoine) Griezmann Kylian (Mbappe). I remember I was young in 1998 and we did not sleep the entire night " a Chandannagar resident said. France lifted the World Cup for the first time in 1998 blanking Brazil 3-0. In 2006 they reached the final only to be beaten by Italy on penalties.